Tunnel machine Bertha crept ahead 6½ feet on Monday, setting the stage to break out of its concrete repair vault this week. A repaired and rested tunnel machine Bertha launched its new year by boring forward 6½ feet on Monday, to the north edge of its repair vault along the Seattle waterfront. The giant Highway 99 drill is expected to grind through an approximately 15-foot-thick concrete wall and escape the vault this week, said an update by the Washington State Department of Transportation. Meanwhile at the north portal, the WSDOT is warning travelers to prepare for weeks of construction blockages from Jan. 18 until early March — when sign installations in the median will force general traffic into the southbound bus lane. One northbound lane with be closed during the first part of the work. Bertha’s progress on Monday allowed Seattle Tunnel Partners to fasten the 161st ring of the future four-lane tube, behind the machine, which has now traveled 1,098 of the 9,270-foot route from Sodo to South Lake Union. The tolled tunnel is currently projected by STP to open in April 2018, some 27 months later than contractors offered in their winning bid for the $1.35 billion contract. This week’s breakout from the vault will bring Bertha to maybe the most precarious section of the project. The path continues through waterlogged, dense sand and clay, until it reaches a concrete box for inspections, then dives beneath the old Alaskan Way Viaduct, past brick buildings in Pioneer Square. For bus passengers and drivers, that entails a two-week closure of the viaduct in March. Besides serving as a safety precaution, the shutdown will help STP measure soil removal more accurately to prevent voids, and allow quick access if contractors need to inject grout to stabilize the soil. Government agencies haven’t yet published a plan for car detours, temporary bus lanes, parking restrictions or other means to control traffic. But they have already provided a hashtag, #99closure. Viaduct users haven’t faced that kind of challenge since “Viadoom” in October 2011, when the south half of the old elevated highway was demolished. Of the five weekdays affected, only the Monday traffic flowed near-normal, due to a 20 percent reduction in driving, before a bounce back to car use combined with freight-train traffic in Sodo contributed to delays of more than an hour, and congestion ripples as far as Bothell. 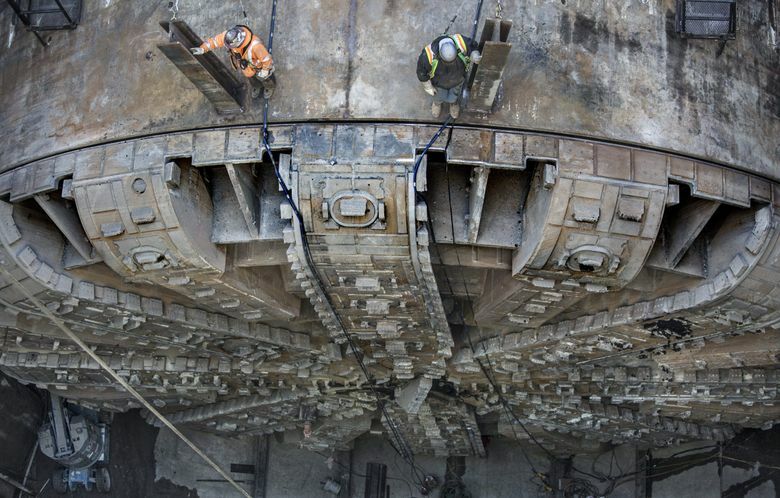 Bertha was launched July 30, 2013, and stalled Dec. 6, 2013, three days after it dug 52 feet, but also hit a steel pipe left over from state groundwater tests, and got tangled in the cutter face. WSDOT disagrees that a pipe hit could cripple Bertha, while insurers argue the 57-foot-diameter machine was inadequate to effectively turn the immense volumes of soil. Hitachi Zosen, which built the $80 million drill in Japan, installed tougher bearing seals and added reinforcing steel last year. Contractors then lowered the 4 million-pound front end into the repair vault, so it could be refastened to the body of the machine during the fall. STP and Hitachi Zosen fronted the costs to revive Bertha, expected to exceed $143 million, but it may take years of disputes and hearings to decide who pays what. WSDOT has paid builders just over $1 billion to date for work already done, and has no Plan B. At the present crossroads, elected officials from Seattle Mayor Ed Murray to Governor Jay Inslee are banking on Bertha’s second effort to succeed.